Well, it's been a long time since I reviewed a Budweiser beer. Back when I started this website, I reviewed Bud Light Lime which was actually only my second review ever on here! Talk about crazy! It's been a couple of years since then and here I am... with another Budweiser. This beer is part of Budweiser's new Project 12 which quite honestly, just seems like a way to try tapping into the craft beer crowd. Not that anyone thinks Budweiser is a "craft" brewery, but apparently they're trying to change their image and be more accepted by the craft beer drinkers. I doubt they can change their image much much since they're pretty much the pinnacle of mass-produced pale, watery American lagers. But, I digress. 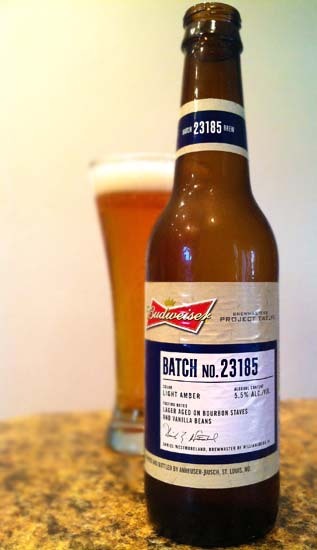 Budweiser Project Twelve Batch No. 23185 pours a clear light amber color with a surprisingly thick, lasting white head. It smells quite mild with dominant notes of bread and yeast, and subtle hints of maple and vanilla. Tasting brings a crisp, light feel with flavors of lightly-roasted sweet malts, a touch of oak, and some light butterscotch and very tame vanilla in the finish. Quite honestly, this was better than I was expecting. It's still really quite mild and has the stereotypical Budweiser crispness, yet it's a helluva lot better than regular Budweiser and Bud Light. Compared to real craft beers, though, it falls a bit short in flavor. You'd think that between the bourbon barrel staves and the vanilla beans that there would be a bit more flavor. The upside in my mind is that this may get regular Budweiser drinkers into branching out and trying new beers. Drink This: if you want to try a Budweiser that has a little more character. Like I said, it's head and shoulders above regular Budweiser and Bud Light. Don't Drink This: if you're looking for a bourbon-aged beer that tastes like a bourbon-aged beer.